This program will set up the Fedora Directory and Administration Servers. OF THIS AGREEMENT, PLEASE DO NOT SET UP OR USE THIS SOFTWARE. Fedora Directory Server system tuning analysis version 10-AUGUST-2007. NOTICE : System is i686-unknown-linux2.6.25-14.fc9.i686 (1 processor). WARNING: 502MB of physical memory is available on the system. 1024MB is recommended for best performance on large production system. The suffix is the root of your directory tree. The suffix must be a valid DN. servers. Enter No or go Back if you want to change something. Your new DS instance 'server' was successfully created. work with the Administration Server. Reading parameters from Administration Server config . . . Using Administration Server URL http://server.your-domain.com:9830 . . .
Reading parameters from Directory Server /etc/dirsrv/slapd-server . . . 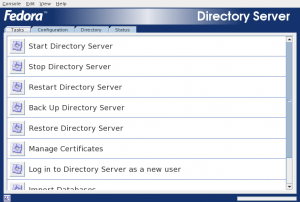 Using Directory Server URL ldap://server.your-domain.com:389/dc=your-domain, dc=com . . . Generating config file /etc/dirsrv/dsgw/dsgw.conf . . . Generating config file /etc/dirsrv/dsgw/pb.conf . . . Generating config file /etc/dirsrv/dsgw/orgchart.conf . . . Generating config file /etc/dirsrv/dsgw/default.conf . . . Generating the credential database directory . . . Adding configuration to httpd config file /etc/dirsrv/admin-serv/httpd.conf . . . Enabling links to web apps from Administration Server home page . . .
/usr/share/dirsrv/html/admserv_dsgw.html already exists - not copying . . .
/usr/share/dirsrv/html/admserv_phonebook.html already exists - not copying . . .
/usr/share/dirsrv/html/admserv_orgchart.html already exists - not copying . . . 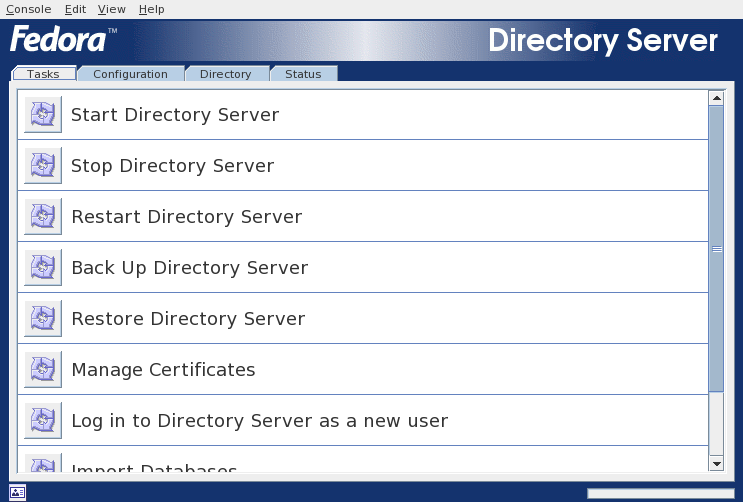 The Directory Server Gateway web applications have been successfully configured. You will need to restart your Administration Server.